Now is a good time to start the end of this blog. I’m sitting at a bar in Nashville, Tennessee enjoying a beer. My old bandmate Tyler, moved down here a year ago and is working at the bar. I wish I could have written down all my thoughts from the last part of my journey while I was there, but I could not. And I could not last month because it was the busiest month of the year for me on general surgery service. But it is all still fresh in my mind. I think about the things I saw and experienced every day, like a daydream. This is a long blog entry. But I think it documents the most interesting and most important experiences of my travels. One thing to worry about is not missing the plane, and that can and should happen if you set your alarm for 5:30PM instead of 5:30 AM for your 9:30 AM international flight. Once again somehow the universe conspired to help me on my journey. Or maybe it was my brain that woke me up in Brisbane at 7:45. I panicked for about 1 minute. Then I decided I was going to make the flight, and I did. Just barely. I sat down in my seat and breathed a sigh of relief. I looked at my hands and they were bleeding. Not sure from what, but I had packed very fast. The plane followed the coast as it flew north along Australia. I strained my eye the entire time to see if I could glimpse the Great Barrier Reef, but unfortunately I could not see it. I hope there will still be unbleached reef when the day comes that I may return to Australia. I opened “History of the Solomon Islands”, and continued reading about my destination. The Solomon Islands are part of a chain of a chain of archipelagos called Melanesia, which stretches from Papua New Guinea in the north to New Caledonia and Fiji in the south. The Solomon Islands cover 310,000 square miles of ocean, 10,639 square miles of which is land divided amongst 992 islands. The largest island, Guadalcanal is the province which includes the nation’s capital, Honiara, which is where I stayed. Depending on the generation who I ask, Guadalcanal is either a familiar or instantly recognizable name. One of the largest naval/air battles in history was fought during World War II as the US advanced towards Japan following the attack on Pearl Harbor. Much more on this later. As for the name of the country, a Spanish explorer found some gold on the islands and erroneously thought the islands could have been where King Solomon obtained gold for his temple. The population is about 450,000, comprised predominantly of Melanesians, with Polynesians, Micronesians, and some Chinese and Europeans. 85% of the population live in villages. As part of the Ring of Fire, earthquakes, volcanic eruptions, tsunamis, and hurricanes are common. 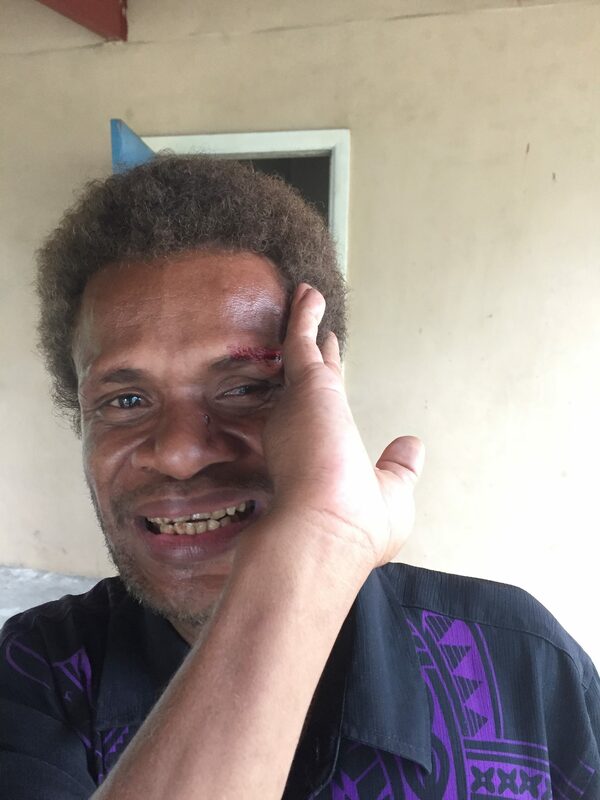 Almost all Solomon Islanders are Christian, with a small minority that still practices traditional beliefs. English is the official language, but Pijin is the language most widely used and understood. I did not anticipate this, but enjoyed the opportunity to catch on to a new language – which is like English with spelling changed to reflect pronunciation. For example, “Where are you from?” is “Yu bilong wea?”. As is common in many island nations, the concept of time is relative. “We control time and not time controlling us” is the general sentiment. The concept of money is also relatively recent. Barter and alternate forms of currency such as shell money in the form of bracelets and necklaces are still practiced. The nation is a constitutional monarchy; it established independence in 1978. Higher education is limited. The first Solomon Islander received a PhD in 1992. He dropped me off at my accommodation at Jubilee House, which houses visiting medical students and residents since it was built in 2013. I was lucky to have Hannah and Eileen, two Australian med students as housemates. 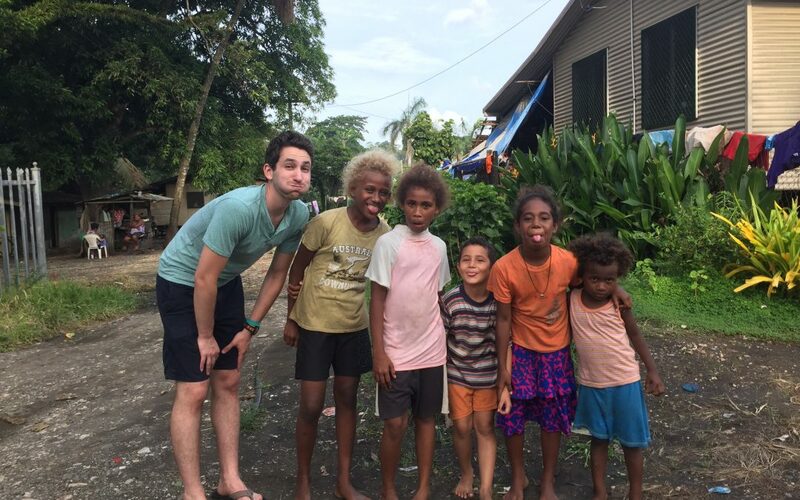 They’d been in the Solomon Islands for a while and already know the lay of the land. Hannah unfortunately was feeling very ill and was wondering if she had Dengue, also known as “bone-break fever”, which is endemic to the islands along with malaria and Zika. I had already gotten quite a few bites in the first few hours there and realized I would have to wear bug spray during the entirety of my time there. Dengue mosquitos bite day and night. I slept under a mosquito net. There was no air conditioning, and the temperature was regularly in the 90s. There was no hot water, but that didn’t matter. We used a large pot to boil all our drinking water. As it turned out, Hannah did have dengue. She was admitted to the hospital ward for IV fluids, but electricity was out at the hospital. I was surprised to see her the next morning in the house with fluids hanging over her bed. At least we had ceiling fans. 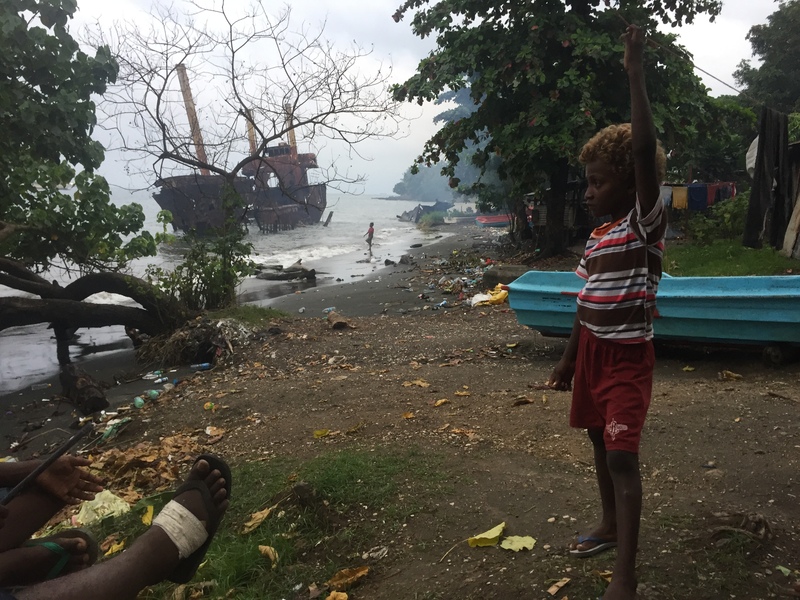 She showed a lot of resilience staying in Honiara, and she did make a full recovery. Jubilee House is located in the middle of a neighborhood where many of the hospital employees live. I went out and met many of them. There was an eerie wreck right on the beach, with a skeleton of a ship almost 90% out of the water. I learned this ship was stranded during a hurricane. I noticed many of the children had striking bright blonde hair. I had read about this, and it is a beautiful trait unique to the islands. This is the only place in the world where dark-skinned individuals have blonde hair. This has been studied and found to be the result of an independent gene mutation which displays autosomal recessive inheritance. It has been described by a genetics professor at Harvard as “one of the most beautiful examples to date of the mapping of a simple genetic trait in humans.” The finding illustrates the importance of expanding genetic studies beyond traditional practices of only including participants of European descent, which result in biased views of how genes and mutations influence observed traits. As I had arrived on a Saturday, Sunday I explored the city in a taxi – which is a van that fits up to 8-10 passengers. 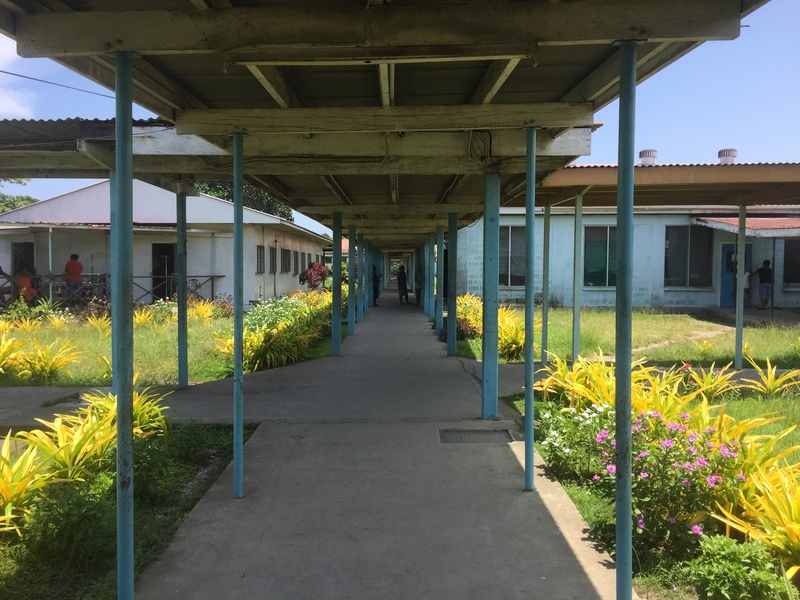 Hannah and Eileen showed me the National Referral Hospital, which is open with outdoor walkways connecting wards in individual buildings, very similar to MTRH in Kenya. The hospital was built with contributions and assistance from Taiwan. Most striking to me was the FNAB ward. “FNAB” is fine-needle-aspiration biopsy, used to sample lung tissue in patients with tuberculosis. I felt like I had two adoptive families, my neighbors and the Aussies. There were quite a few Australian expats living in the Solomon Islands. They included lawyers, engineers, economists, doctors among others. I was particularly inspired by a guy named Dan, who was working to encourage and promote youth soccer as for kids well-being and as a deterrent from crime. One of my favorite experiences was getting to watch the Australian Open Final between Federer and Nadal with the Aussies. Monday, I started working in the eye clinic. The Regional Eye Centre was built by the Fred Hollows Foundation and the New Zealand Government. Fred Hollows was a kiwi ophthalmologist who traveled to a number of countries including Eritrea and Nepal and was shocked by the lack of medical resources and the prevalence of cataract blindness, an easily treatable condition. 4 out of 5 people who are blind have a condition which is preventable or treatable. He dedicated his life to bringing down the cost of cataract surgery. He started lobbying multi-national manufacturers of intraocular-lenses (IOLs), the tiny artificial lens placed in the eye after the cloudy old lens cataract is removed. When this failed, he came up with a bold plan to raise money to build his own IOL factories. He traveled extensively and believe training and empowering local people was the only way to bring about lasting change. In his lifetime, he trained hundreds of eye doctors to perform cataract surgery. In the last few months of his life, despite battling cancer, he discharged himself from a hospital and flew to Vietnam where he trained 300 Vietnamese eye specialists. His factories, which opened a year after his death in 1993, produced IOLs which cost $5 compared with $200 previously. Since 2002, the Fred Hollows Foundation NZ has been tackling avoidable blindness in the Pacific Islands. The Pacific Eye Institute was built in 2006 in Suva Fiji. Dr. Posala was a member of this first class of doctors trained there. 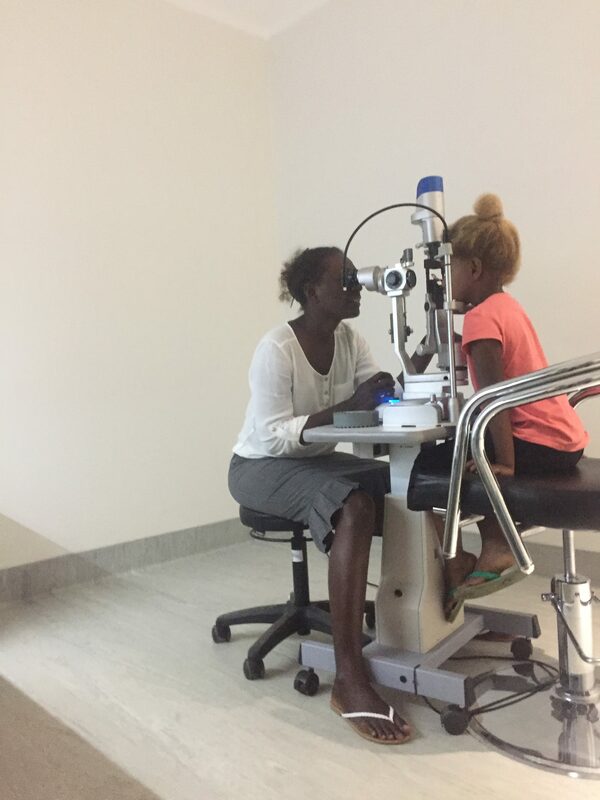 The Regional Eye Centre opened in Honiara in 2015, and provides free eye care to all. It is the only eye clinic in the 900+ islands. It contains rooms for eye surgery, diabetic retinopathy treatments, minor procedures, sterilization and classroom training. The building is green and off-grid with 94% of the building’s power derived from solar energy and filtered rainwater running through the taps. The New Zealand pine used in construction means it’s expected to have a 50-year lifespan. I spent most of my time with Dr. Nola Pikacha, who also is from the Solomon Islands and trained in Fiji. Her mother was the first female doctor from the Solomon Islands; Nola is the first female ophthalmologist. She was extraordinarily generous in teaching me how the clinic operates, teaching me some of the common Pijin terms used in the medical setting, and answering my questions about ophtho concepts. I learned quickly how prevalent diabetic retinopathy is, similar to New Zealand. There is a genetic predisposition, but also much of the diet has changed from fresh fruits and vegetables to processed foods. I met many patients who were nearly blind from diabetes. Looking at photos of the retina in the back of the eye, it was not uncommon to see large areas of hemorrhage from leaky blood vessels which supply the sensory components of the eye. She gives lasers treatments to help prevent further vision loss. There was also a lot of trauma. One gentleman was working in a kitchen when a large boulder fell of a cliff behind his house and rolled into his house. A beam of wood hit him in the eye. After that first day of clinic, Nola drove me to see the war memorials. 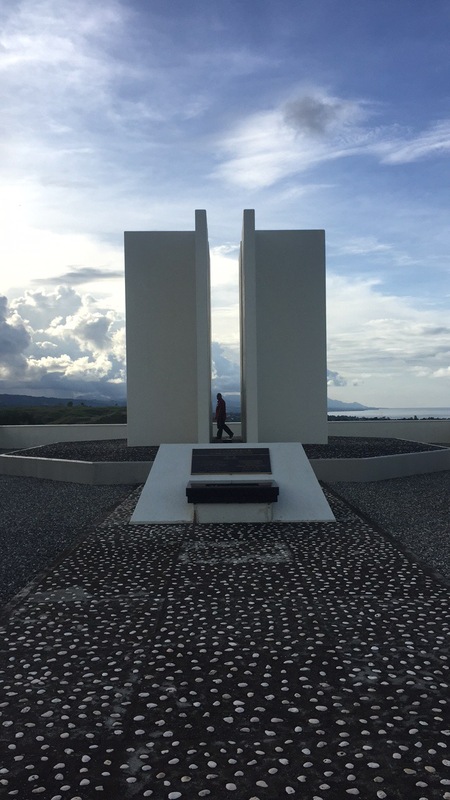 Both the USA and Japan have memorials built on separate hills within eyesight of each other high up over the city of Honiara. The Guadalcanal Campaign was fought from August 7th 1942 to February 9th 1943. It was the first major offensive by Allied forces against the Empire of Japan after the attack on Pearl Harbor. Along with the Battle of Midway, it was a major turning point in the war. 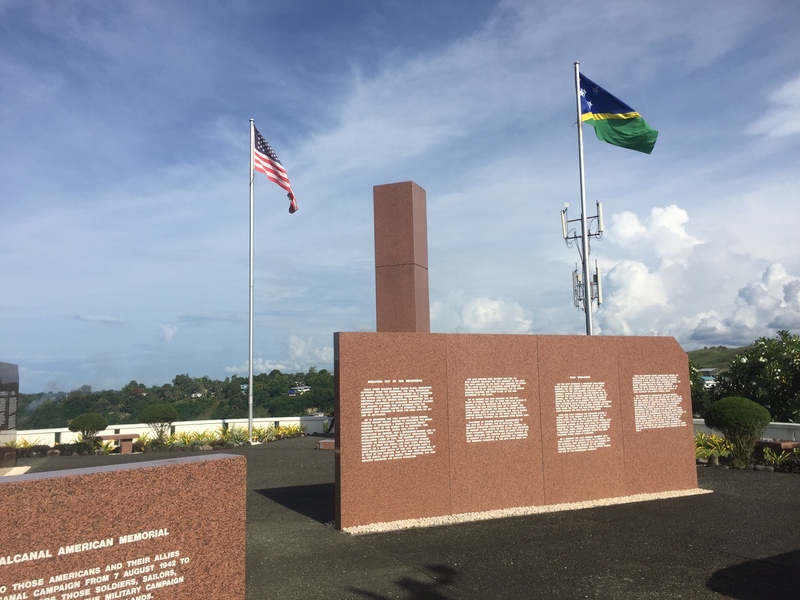 The Solomon Islanders joined the Allied efforts and were critical in their military success. Over 25,000 were killed in the campaign. Over 60 war ships and 1,200 aircraft were lost. The body of water between Guadalcanal and Savo and the Florida Islands is littered with these wrecked vessels, such that it is known as Iron Bottom Sound. The primary strategic point of the battle was control over Henderson Airfield, the airport where I landed. The memorials are a reminder of what men can do to each other. Both, however, are very beautiful, featuring art and beautiful gardens. Many come to the Solomon Islands to dive the WWII wrecks, but the diving is in fact incredible just in the abundance of life in the reefs. I enjoy diving because there is a certain type of peace and calm when you get down to 30m below water which cannot be replicated above. 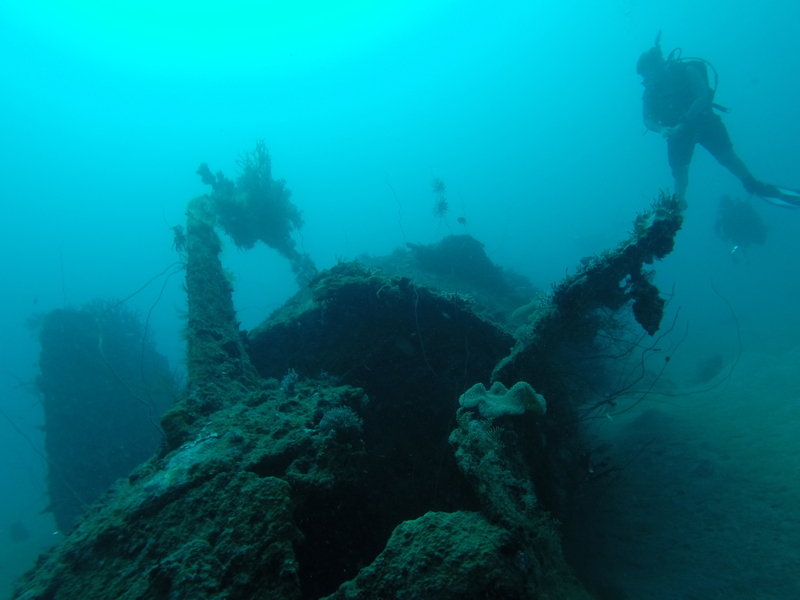 During my first week I joined a shore dive at Mbonegi Beach about 30 minutes north of Honiara and dove the Kinogawa Maru (B1) and Hirokawa Maru (B2), two Japanese ships which were torpedoed and sunk right off shore. On B1 we swam through the torpedo blast hole. 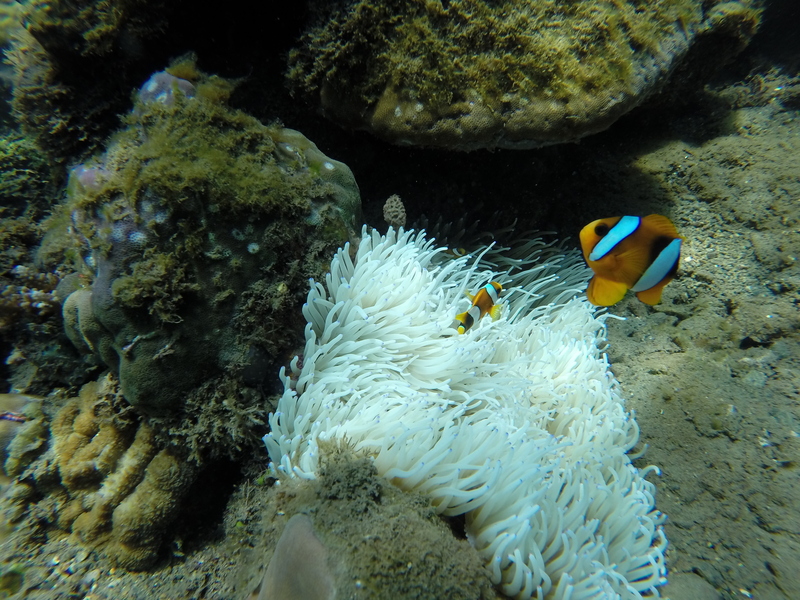 The visibility was excellent and I saw clown fish and stingray. The coral formations are truly stunning – an eerie beauty. The ship is a memory slowly fading away. B2 is partly above the water still. The most emotional dive for me was the I-1 submarine about an hour north of Honiara. This Japanese submarine attacked Pearl Harbor. 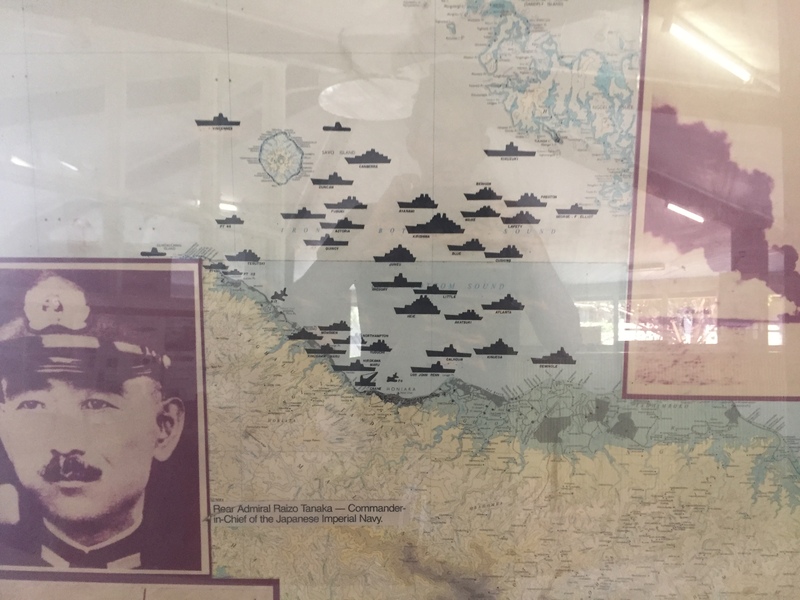 During the Battle of Guadalcanal, a kiwi ship saw the dark shadow of the submarine below the water and dropped depth charges which disabled the engine and forced the sub to surface. The kiwi ship then rammed the sub three times until it became caught surfaced on the reef. The sub contained critical Japanese code documents written on papyrus. The Japanese tried to intentionally sink the vessel to dissolve the papyrus but failed. Allied divers were able to enter the sub and retrieve these codes which were critical in turning the tide of the war. There are some gaps in this story, and I do not like to think about what happened the Japanese men aboard the submarine. In the 60’s, divers tried to plunder precious metals in the ship and set depth charges to gain access. They did not realize there were still two live torpedoes and the resulting explosion sprayed large metal debris into some of the nearby villages. Now the back half of the submarine is splayed open. As I dove into this entrance and viewed the submarine from the inside, I was taken aback by how well parts of the ship were still preserved. 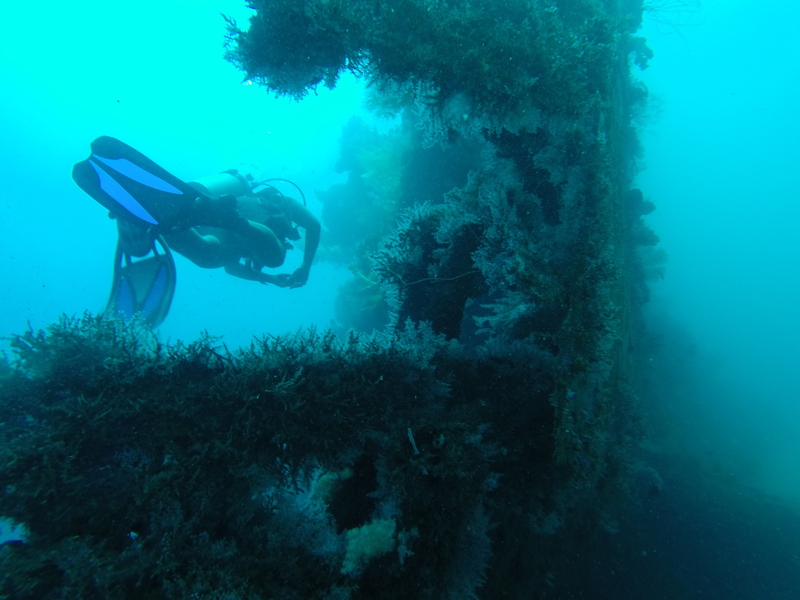 The coral growing on the submarine was massive and among the most beautiful I’ve ever seen. It’s amazing how such carnage and death can be replaced with vibrant life. 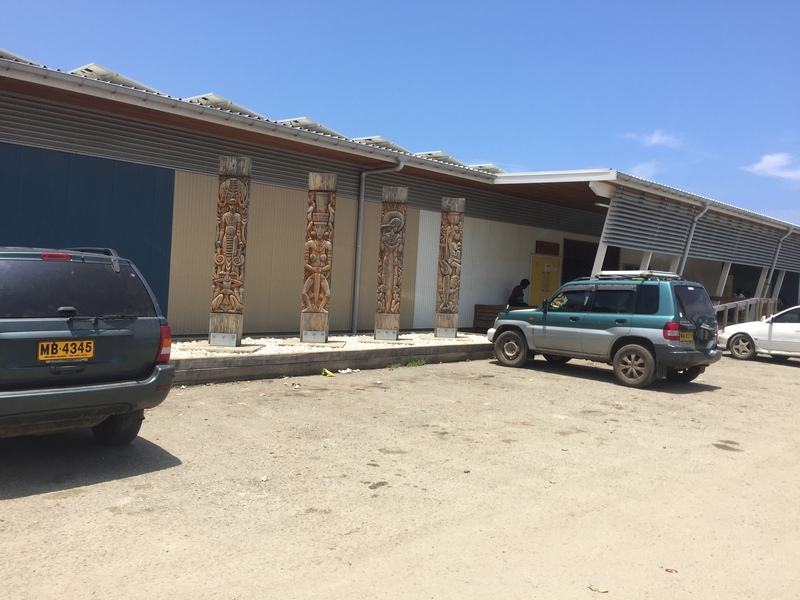 The national museum in Honiara is free to the public. It features local art and historical relics, such as jewelry made of dolphin teeth, and traditional pan-flutes. I also learned that JFK served with the US Navy and was captain of a patrol torpedo boat which was sunk by the Japanese. Kennedy and 10 of his men were stranded and survived for days swimming between nearby islands searching for food and water. They were discovered by Solomon scouts. Kennedy famously carved a message in a coconut, which was carried by the scouts as they paddled 60km overnight through enemy waters to the nearest Allied base. It is an extraordinary story of how the Solomon Islanders saved the life of the future president of the United States. The Honiara market is an eye-opening sight. It is an open market packed with farmers, fisherman, and craftsman from all the regions. It is a bit of a maze to navigate, and many of the families who boat in to sell their goods sleep on the floor. A pineapple costs about 3 Solomon dollars which is about 38 cents US. It was the most delicious pineapple I’ve ever tasted. I got most of my food from the market and once enjoyed drinking a freshly cut coconut with a straw while I walked the bustling sidewalks on a hot day. The Regional Eye Centre has a state of the art operating theater. I got to help administer retroorbital nerve blocks to patients. Interestingly there is no anesthesiologist. No IVs. Any surgery requiring general anesthesia or IV medication is performed in the main theater in the hospital. This contrasts the US, where any ocular surgery has an anesthesiologist monitoring the patient. Many surgeries are done awake, but patients are always given propofol or a benzodiazepine. I realized that this is not necessary in many cases. 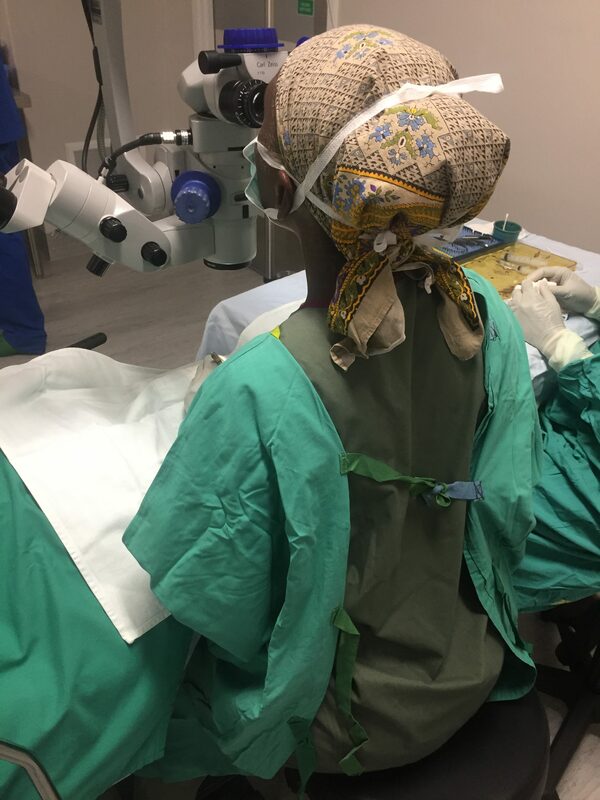 The primary challenge I observed is many patients attempting to reach up to touch their eye during the surgery, not comprehending the importance of the sterile field and the delicacy of the procedures. All of the nervous patients were calmed by talking and providing reassurance. I witnessed small incision cataract surgeries, which is a technique employing the cheaper rigid lenses produced by Fred Hollows. I described the difference between phacoemulsification previously in my Rotorua blog entry. Notably, this procedure is much quicker. Also the turnaround time in the theater was the fastest I’ve ever witnessed. The next patient was brought in immediately after a case. At my early point in my career, it was incredible to see such efficiency. Also the cataracts were so advanced, it was clear the patient had not been able to see for many years. After a day or two, they will be seeing again. I also wore Crocs for the first time, the footwear of choice in the theater. The internet was very poor, it would take about 20 minutes to send a photo. Thus I largely disabled and remained off of social media while in the islands. And this is also why blogging got delayed. The days seemed to keep getting hotter, and the last photo from Instagram which had loaded on my phone was a photo of a dog in the snow, which I often found myself looking at longingly. About the same time, Trump hung up on the Australian Prime Minister because he didn’t want to take in refugees as previously agreed. A ~10-year old girl named Ellen who lived next door often came over. She was learning how to read and Hannah and I would listen and help with the difficult words. She showed us a peculiar wound on the shin of one of her legs, and said it was from a fall. A few days later I went to Grand Rounds and listened to a terrific talk by Dr. David Fegan, who is an expert on tropical diseases. One disease he discussed is yaws, which is related to syphilis but is spread by general contact and is not an STD. It is common in children living in rural villages. I whispered to Hannah that I thought Ellen’s lesion on her leg might be yaws. The next time I saw her I asked, and she replied that it was yaws and she was being treated. She had recently moved to Honiara from the province of Malaita. My final weekend in the islands, I went to Savo. Savo is a volcanic island that last erupted in the 1840’s. I was joined by Nana, an economist from Zambia, who had been working in Honiara for the past two years. It was a 45-minute boat ride to Savo. We were greeted by a pod of 100s of dolphins. Nana and I weren’t planning on hiking, but we decided to be brave and go for it! 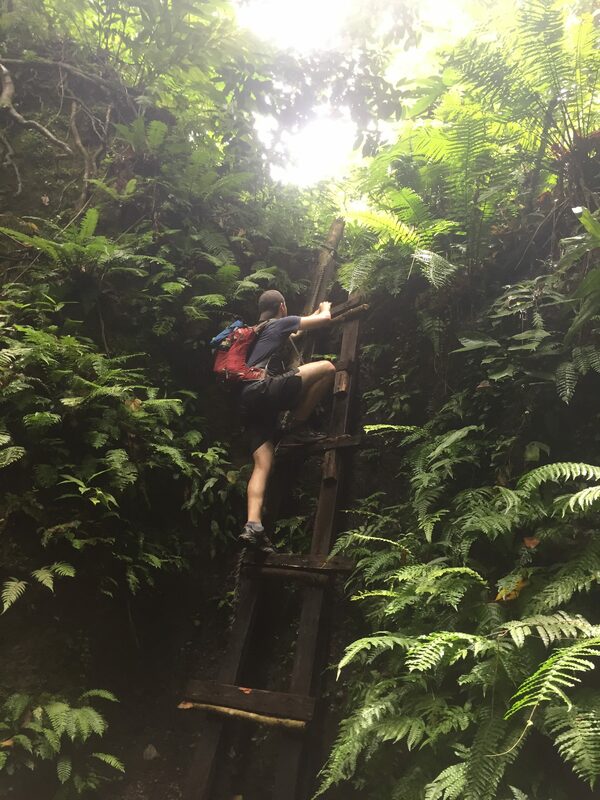 We hiked 4 hours to the top of the volcano and back down. It was one of the most grueling hikes I have done. 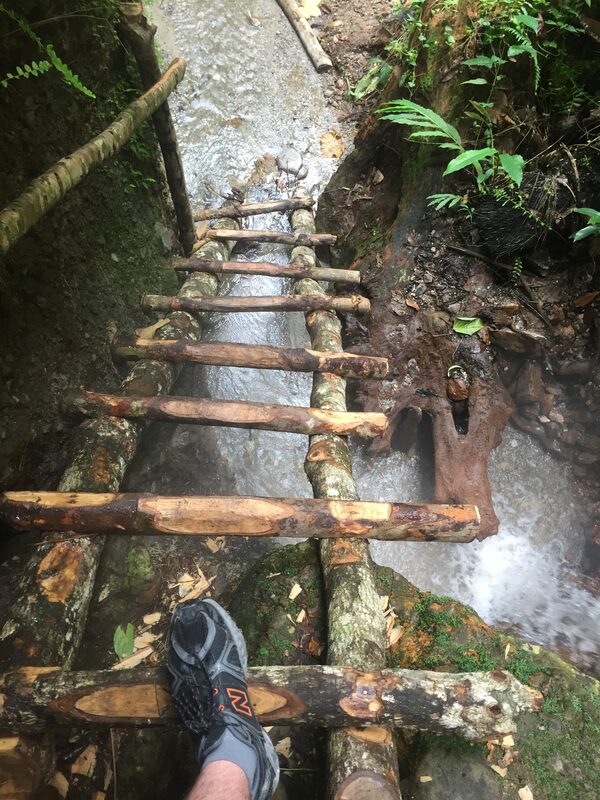 The hike followed a hot spring and was treacherous at times with loose rocks and ladders traversing waterfalls. We had to cross the spring many times on the way up and eventually the flowing water was boiling. It was absolutely beautiful though. The thick jungle, the call of birds, the life of a secluded place. The warm steamy blast of Sulphur from the rock face on the side of the trail added an additional effect. On the way down I talked to Vasily, a gentleman from Ukraine who was traveling through the South Pacific for 3 months for pleasure. He was traveling with only the clothes he was wearing and his day pack for the entire 3 months. It was another lesson in holding on to experiences rather than things. The spray of the ocean on the boat ride back was very pleasant. Flying fish soared along the boat. 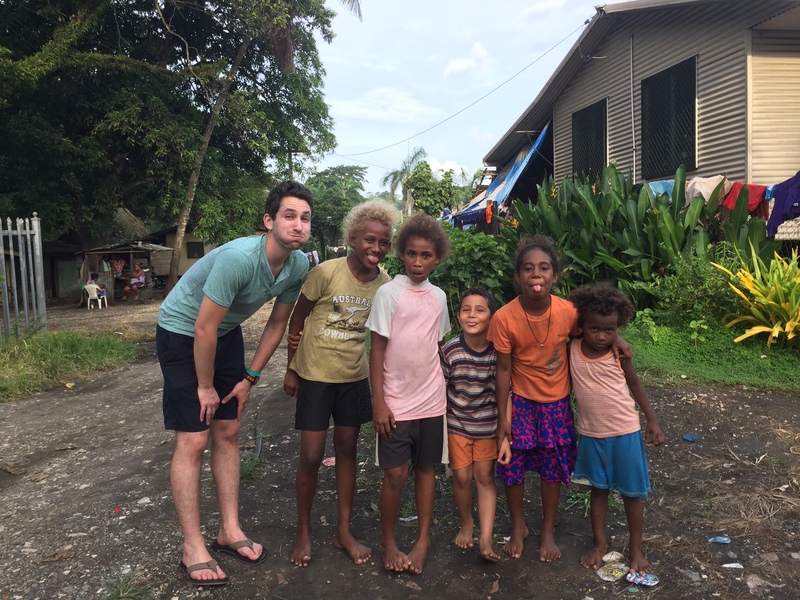 My final days in the Solomon Islands were rainy and puddles filled the roads. Nana and I watched a kiwi film called the Hunt for the Wilderpeople, which was really good. I of course took many opportunities to play guitar with the kids in the neighborhood. 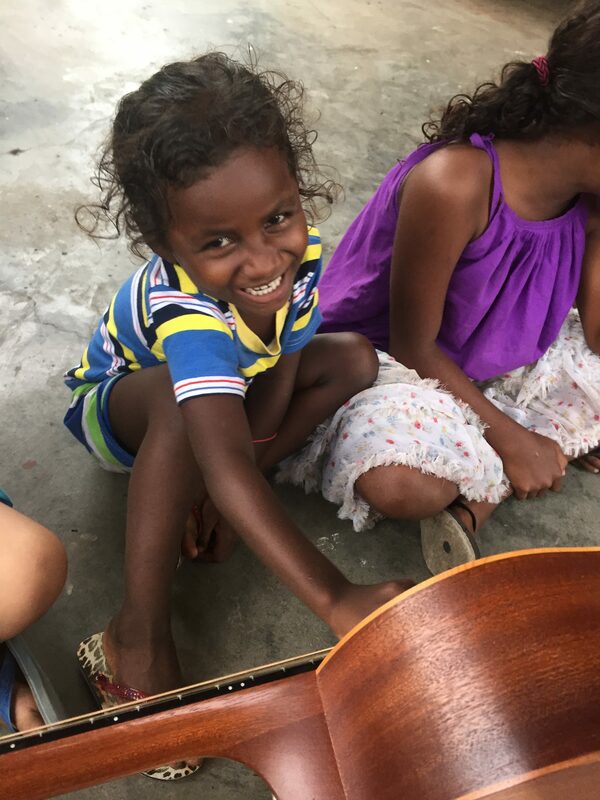 I brought my guitar into the clinic and was really impressed by Jimmy, one of the registrars who had taught himself to play. My last day of clinic I said goodbye to all the wonderful people at the Regional Eye Centre who had taken me in as one of their own. As I left for the airport, Ellen gave me a folded up letter wrapped in string. She had written a lovely note thanking me for being a friend and reading with her. She had taped seashells to the paper since she knew I loved them. I connected through Fiji. I opened the Fijitime flight magazine was an article about the Fred Hollows Foundation. There was a photo of Dr. Claude Posala and and Nola Pikacha smiling at me. After a very long day, I arrived in LA and stayed with my friends Adam and Carolyn in Hermosa Beach. I took a tour of the Space X facility where I saw space rockets being built and thought about my purpose and place in the universe. I did not need to boil water or sleep under a mosquito net anymore. I took a warm shower. I watched a sunset in Santa Monica and thought about what was happening on the other side of the Pacific. New Zealand, Australia, Solomon Islands. I flew back home to mild winter in Indianapolis on February 15th. Home where there are no mountains or oceans. But home to friends and family. Thank you for reading this blog. I’ve documented these moments mostly for me to have as a personal reminder in case I ever become burdened to a point where I forget to awe at the wonder of the world. In case I ever forget that if I really want something, I can go and do it. I hope some of my optimism and inspiration I’ve drawn from my experiences has captured your imagination in some way. Until next time! Hanging out with the neighbors. Featuring blonde hair and ship wrecked by a hurricane. Dr. Nola Pikacha examines a child’s eyes with a slit lamp. A fraction of wrecks in Iron Bottom Sound. The typical reaction when playing guitar for the first time. Goodbye to my new goofy friends. Ellen is next to me. The Solomon Way. Thank you for the shell bracelet. Hope your eyebrow healed alright!